Everyone makes lots of little decisions from the moment they wake up until they sink back into sleep at night. Decisions that have no consequences or expectations. But, what about the rare choices that could change everything? How do you know what is right for you? Happiness is something you have to choose again and again, each day. Michaela Matthews wants that more than anything. Standing in her way is a family pushing her down a specific path and the man she loves preventing her from choosing anything different. When she moves to the city for the next step in her parent’s plan, she starts to figure out what she wants - or more importantly, what she doesn’t want. She thinks she has to leave her old life behind to discover a new one. This throws every choice she has made into question. It isn’t until tragedy strikes that she learns that sometimes there is no choice at all. Sometimes you can have it all. Jason Marks has had the kind of life where things have seemed to just happen to him, no choice involved at all. It’s a struggle for him to keep the past at bay while he tries to move forward. He is no longer the unwanted foster kid. He is a business owner, surrounded by people that love him. But, he isn’t in love. He’s not even sure he believes in it. Not anymore. At least, not until a heartbroken girl falls apart in his arms. It’s enough to make him a believer. Make him a dreamer. Enough to force him to answer that question. Do you give all of yourself to someone who might not choose you in return? Yes. Yes, you do. Michaela Matthews’ life has been all planned out: graduate law school, marry her longtime boyfriend Ethan, become a corporate lawyer like her emotionally distant father and a socialite like her domineering mother. And she wants out. When she meets Jason, a handsome bar owner, she sees in him a way to live – and love – on her own terms. Michelle Macqueen’s romances always strike a chord with me, because the characters that populate her books feel like real people (despite being exceptionally good looking, lol). Her writing style let me into the heads of both main characters, including their fears and insecurities. Despite being from different worlds, their chemistry when together is remarkable. They’re the kind of couple you root for, no matter how great the odds of them succeeding are. There were times when I wish Michaela could have stood up to herself more, especially when her overbearing-borderline-abusive long-time boyfriend Ethan started to show his true colors. Growing up under the same roof as two stifling parents, though, makes me understand her weakness. Choices is a good, solid read for those who like real-life romance. It’ll make you happy and sad, tug at your heart-strings, and leave you satisfied that even those with so little in common can find a place in the world together. CHOICES by Michelle Lynn is a sweet and quick read. Let me first point out that Choices is an adult contemporary romance but has a strong Young Adult crossover appeal. The main character, Michalea is a recent college graduate and is still young enough that her story will appeal to younger readers. Michalea and her brother Chris have grown up in a world where image is everything. Their father is a big time corporate attorney and he expects his children to follow in his footsteps. Mic has just graduated from college and is on her way to New York City for law school. She’s been in a relationship with her high school boyfriend, Ethan, the entire time and the expectation is that they’ll get married, someday. But when her boyfriend pops the big question unexpectedly, Mic has to make a decision. Just because your whole life has been mapped out and you know what you think your future holds doesn’t necessarily mean that is the best choice for you. She rejects Ethan’s proposal and moves in her big brother in New York City. She ends up deferring law school for a semester and getting a job at Chris’ law firm as a secretary. And in enters Jason, one of Chris’ best friends. He comes from a completely different world than Mic and Chris and has his own issues when it comes to family and love but all bets are off when he meets Mic and immediately knows she’s the one – even if she’s still in love with someone else and totally off limits because she’s his best friend’s sister. I didn’t care at all for the character Katie, one of Mic’s friends. Most of her actions didn’t make sense to me and the events she set into action never felt resolved. 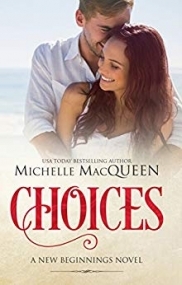 CHOICES is a quick and enjoyable read about the sweetness and difficulty of first true love and how faced with difficult or impossible circumstances, the right people always end up together.